It was 18 years ago that the first Acoustic Energy AE1 made its debut. The launch caused a stir, and a positive reaction among reviewers who got their hands on early samples. The original AE1 broke fresh ground. It invented the concept of the high performance miniature, where there was virtually no relationship between size and price, and where at least as much effort was expended on engineering the enclosure as the drive units. We reviewed an evolved version of the same speaker in 1991 with somewhat more equivocal results. But in the mid-1990s Acoustic Energy upped the ante by introducing a Signature variation, which cost £2,000 in 1995. Whereas the original AE1 had been finished in the rugged textured black that is regarded as mandatory by professional users, the Signature added 'luxury finish' to its 'high performance' characteristics. That Signature formed the basis of a formal MkII version of the AE1, which ran from 1996 until a new and considerably revised MkIII appeared in 2003. While the original AE1 initiated the modern trend towards high performance miniature monitors in the late 1980s, it wasn't without some precedents - one can point towards the remarkable Goodmans Maxim from the 1960s, or the legendary BBC LS3/5a, based on carefully selected KEF drive units, in the 1970s. While the LS3/5a was popular with broadcast engineers and hi-fi enthusiasts, modest power handling and loudness capabilities kept it out of the recording studios. These were effectively the key ingredients that the AE1 brought to the party - the specification claims suitability for use with amplification capable of 200 watts per channel. One contributing factor in the enhanced power handling was the use of a metal cone for the main bass/mid drive unit. Indeed, the use of metal diaphragms for both of the drive units was another of the AE1's more influential innovations. We'd seen metal diaphragms used previously for tweeters (Celestion etc), and for full-range drivers (Jordan, Bandor). But the AE1 might well have been the first traditional two-way, and certainly inspired brands like Monitor Audio to follow suit. That original AE1 cost £700 per pair in 1988, in an era where most miniatures from most leading brands cost £99 or even £79. Eighteen years of inflation would probably take the equivalent price today up to or beyond £2,000 so it's all the more credible that this replica costs an inflation-busting £845 per pair. Every effort has been made to create an accurate replica of the original, and to these eyes it looks as good today as it did back then. There might be customers who prefer fancy real wood veneers covered in layers of lacquer, or high gloss piano black, but the Pro-look textured matt black has an understated power and a persuasive purposefulness all of its own. Both drivers are neatly flush-mounted, and separated by attractively symmetrical twin flared ports, and all the cabinet edges are slightly rounded. The only asymmetry is the badge, fixed across a top corner, and this is mirror imaged between the two samples of a pair. The main driver has a 110mm pressed steel frame and a deep-anodised 90mm aluminium cone, stiffened by an oxide skin, while the tweeter uses a 25mm magnesium dome. The crossover network, fed from a single terminal pair, uses symmetric third-order slopes. The wood-based enclosure is actually made in Malaysia by AE's parent, but all the rest of the manufacture is carried out in Britain. The most interesting feature of the latter is that the insides have a sort of plaster (polymer composite) lining. The specification claims a sensitivity of 88dB, which is at least 2dB more optimistic than the figure indicated by our own far-field in-room findings. Our rating of 85dB is below average, though not unexpectedly so for a system with such a small main driver, especially since the impedance is very benign, staying comfortably above eight ohms throughout. The twin port arrangement is tuned to 55Hz, ensuring reasonable bass output down to around 45Hz, though the impedance does show a slight discontinuity at around 5.5kHz. The in-room far-field tonal balance response trace in free space shows the expected shortfall at the bass end of things, with output starting to roll off below 70Hz. However, from 80Hz upwards, the curve looks very well balanced, holding within the tightly specified /-3dB limits even under in-room conditions. 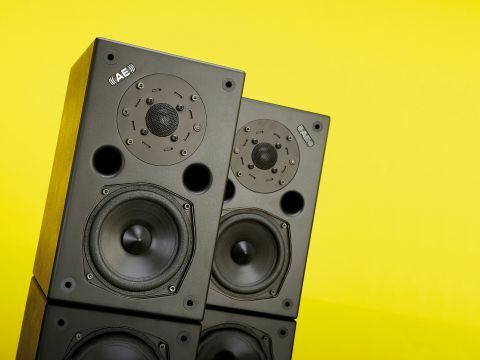 The modest bass extension suggests close-to-wall bass reinforcement might prove beneficial, and the speaker is likely to work best in smaller rooms, but achieving a good alignment is not guaranteed. If one's prepared to sacrifice bass weight and extension, though, the AE1 seems likely to fill a nearfield monitor role rather well. Placed on Partington Heavi stands and connected to the end of a Naim-based system, this little speaker immediately demonstrated both the advantages and the disadvantages of its miniature dimensions. It goes without saying that there's not going to be much in the way of low bass going on here, and this is an obvious candidate for subwoofer reinforcement. But its fine coherence and impressive freedom from boxy effects provide very fair compensation. A small box is nearly always associated with low cabinet coloration and sharp, precise imaging, and the AE1's elaborate enclosure engineering really pays off here by creating an exceptionally 'quiet' box with very little sonic signature of its own. The consequence is a beautifully spacious image with fine focus alongside a broad and deep spread. Superior midband neutrality and a very even balance are both on the agenda here, going a long way towards justifying this speaker's monitoring status. This is further strengthened by the notably wide dynamic range and very low level of background 'grunge' created by that remarkably well controlled enclosure, even though the degree of dynamic expression seemed a little muted.